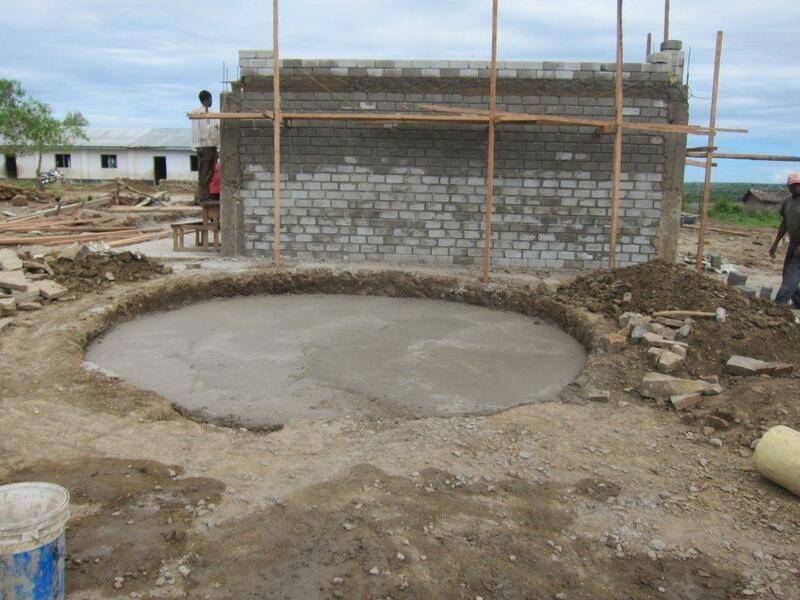 The representatives from Thrive Life and I will be helping a school build a water cistern like the one in the picture. It captures the rain water from the school and gives them relatively clean drinking water, which is a huge improvement over their former routine of having the children walk a far distance to a pond to get very dirty water. 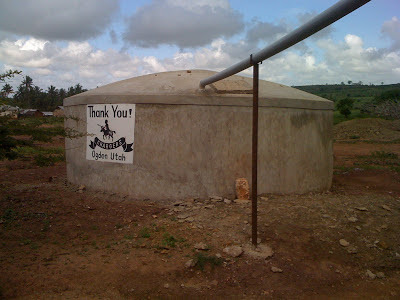 A large water cistern that collects water from the roof of the school when it rains. This was installed in a village thanks to a school in Ogden Utah. There are no water systems to provide water for this village. They walk to the closest pond or river depending on the dryness of the season. Women carry five gallon jugs of water on their heads every day for long distances to provide water for their families. In most cases the water that they collect is polluted with bacteria, microorganisms, and other impurities. Having a cistern to capture rain water can literally be the difference between life and death for some of these children. This cistern program is an option that they can utilize until they are able to gather the resources for a better water system. The philosophy of Koins for Kenya and The Institute for Self Reliant Agriculture,SRA is to ask the people receiving help to do all that they can on their own: i.e. - haul sand from the river, break rocks into gravel, provide the labor, and come up with 10% of the money. It costs $4000 to for the rest of the supplies that need to be purchased. The average wage is about $1 per day so it would be impossible for them to raise the money for the entire project on their own. 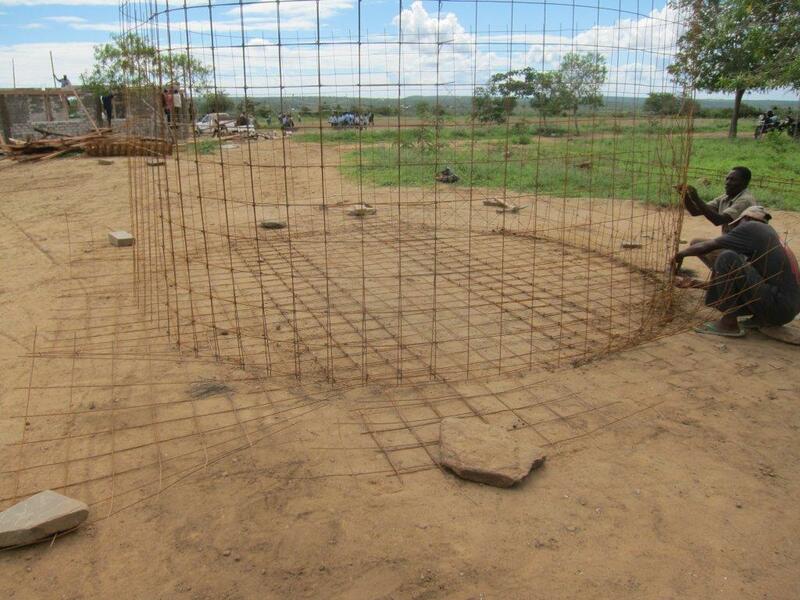 With this program, the villagers feel ownership of the project while the donors make it possible to be completed. 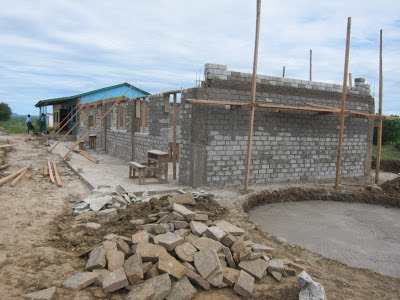 This school is being built as part of a similar program where donors provide the financial assistance that bridges the gap between what the people can do themselves and what needs to be done. This model has helped to build over 50 schools that now educate about 8000 students. It is amazing to see what has happened. The cistern skeleton is being done. This is a very exciting time for the villagers. Great question. The plastic cisterns work well at first however they have severe weaknesses. It is easier for vandals to break off the valves, cut holes in the tank, etc. When water is scarce people do strange things. The plastic also deteriorates over time in the intense equatorial sun. As you pointed out when the locals build it themselves they own it and know how to repair it. The tanks are better maintained. If an NGO puts in a plastic tank and for some reason it doesn't work the locals generally leave it alone waiting for the NGO to come back and fix their (the NGO's) tank. Ownership is a very important part of helping lift the people.